After a full thickness corneal transplant, you will need to wear an eye patch for about a day. Then you will need to wear a clear eye shield or glasses to protect your eye until it has healed. Your eye may feel irritated or scratchy for a few days after surgery. But it's important not to rub your eye. Rubbing your eye could damage it. 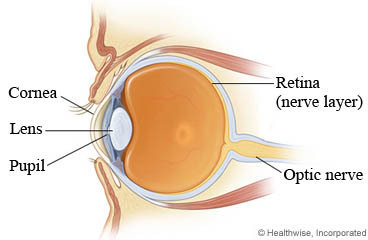 Your vision may be blurry for a period of time after surgery. For some people, it may take many months, and even up to a year, to get the full benefits of surgery and to see as clearly as possible. Your doctor will give you eyedrops to help your eye heal and prevent your body from rejecting the donor cornea. Use the drops exactly as directed. You will need to see your doctor often to have your vision checked. Also, you will usually need to see your doctor to have the stitches removed. The stitches may be removed all at once, or they may be slowly removed over months or years. You will probably be able to return to work or your normal routine in about 1 to 2 weeks after surgery. But your vision will still be blurry. You will need to avoid heavy lifting for about 3 to 4 weeks, or until your doctor says it is okay. Wear your eye bandage, patch, or shield for as long as your doctor recommends. You can shower or wash your hair the day after surgery. Keep water, soap, shampoo, hair spray or hair dyes, and shaving lotion out of your eye. Do not rub or put pressure on your eye. Do not wear eye makeup until your doctor says it's okay. You may also want to avoid face cream or lotion. Avoid heavy lifting for about 3 to 4 weeks, or until your doctor says it is okay. Avoid swimming, hot tubs, gardening, and dusting for about 3 to 4 weeks. You have new eye pain. You have new redness in your eye or pus draining from your eye. You have changes in your vision, including flashes or floaters or worsening vision. Your vision does not get better as expected. Enter R222 in the search box to learn more about "Corneal Transplant (Full Thickness): What to Expect at Home".